• Dobbs didn’t start at quarterback when he enrolled at the Naval Academy Prep School. Coaches played him at first at fullback, and Dobbs wasn’t happy. 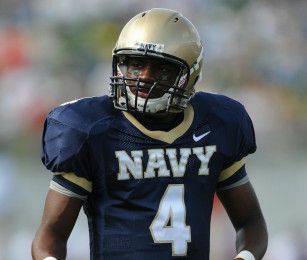 Navy was the only Division 1 school to offer him a scholarship, but Dobbs thought he was offered a false bill of goods. “I’d been a quarterback all my life and suddenly I’m trying to learn a position I’d never played. I was like, ‘This isn’t what I signed up for.’ I had to think long and hard about whether or not I wanted to even go to the academy,” Dobbs told Wagner. Not until his last game for the NAPS football team did coaches start him at quarterback. • Dobbs wanted to transfer when Paul Johnson took the head coaching position at Georgia Tech. • Despite a sometimes contentious relationship, offensive coordinator Ivin Jasper called Dobbs the best option quarterback he has ever coached. Consider he’s coached some great option quarterback such as Dobbs’ predecessor Kaipo-Noa Kaheaku-Enhada and that’s a weighty compliment. Again, go read the whole article. It’s chock full of interesting quotes and tid-bits never before heard about Dobbs’ time in Annapolis.